Start planning your trip to Silverstone for the 2019 British Grand Prix on July 11-14. Silverstone is a village on the borders of Buckinghamshire and Northamptonshire, 75 miles (120km) North West of London via the M1 motorway (Google Maps link). It is fifty miles to the South East of Birmingham, one of the largest cities in the UK. The track is surrounded by several towns and villages, all of which have accommodation options (which tend to sell out well in advance of the Grand Prix weekend). The market town of Buckingham is 6 miles (10km) south of the race track and the small town of Towcester sits just 5 miles (8km) to the North. The larger Milton Keynes is just 15 miles (24km) away, as is Banbury. American, Canadian and Australian nationals don’t need a visa to visit the UK as a tourist. Neither do those from the European Economic area and Switzerland, plus most of the Caribbean, Japan and South America. Travelers from outside these countries should check UK immigration rules, as a short stay visa may be required. Being set in a rural location rather than a city, the British Grand Prix is a relatively safe event to attend, though we always recommend common sense when it comes to keeping an eye on your belongings. This is particularly true if you are camping. There is a reassuringly strong police presence in the UK, though visitors staying in cities or larger towns should behave as they would in any unfamiliar place and avoid walking anywhere alone at night. The UK’s currency is the pound sterling (GBP or £), which has fallen significantly against most major currencies since the Brexit vote in 2016, making a trip to the British GP cheaper for traveling fans. It’s not necessary to purchase pounds before you travel; cash machines (‘cashpoints’ in the UK) are everywhere and credit cards are widely accepted. Tipping is not necessary, though it is common to reward good service from taxi drivers, at restaurants and in hotels. July is one of the hottest months in the UK, though British GP weather can be unpredictable. Recent race weekends have had everything from scorching heat to serious downpours. Don’t underestimate the UK’s sun; the average temperature in July 2018 was 17°C (63°F), with temperatures reaching as high as between 22 and 25°C (72-77°F). If the forecast is for warm weather, you’ll need sunscreen, plenty of water and a hat (especially if you are in an uncovered grandstand or general admission). Being an English summer, of course, we’d also recommend that you bring waterproofs and something warm but light for pulling on if it gets a bit breezy at the track. All tourists in the UK are entitled to the same emergency care as nationals, and visitors from within the EU can access emergency medical care upon presentation of a valid EHIC card. Fill out an application form at your Post Office or request one online – they’re free. Always ensure you have good travel insurance before you set off. If you are from outside the EU, you will need to claim on your insurance policy for hospitalization and repatriation in the case of an accident or serious illness, so don’t leave anything to chance. Been to the British Grand Prix? Leave a comment with your travel tips! Planning a trip to Silverstone for the 2019 British Grand Prix on July 12-14? Read our budget planner to help plan the cost of your trip. 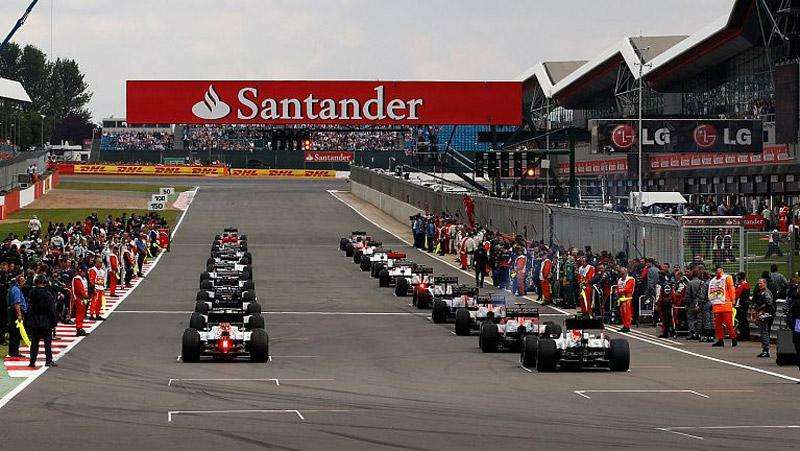 Silverstone, known as the “home of British motorsport,” was part of the original World Championship in 1950 and has hosted the British Grand Prix more than 50 times. The best things to do away from Silverstone this year. The British Grand Prix takes place on July 11-14, 2019. Advice on the best ways to get to Silverstone for the British Formula 1 Grand Prix. Your guide to buying tickets and the best places to watch the action at Silverstone for the British Formula 1 Grand Prix. From trackside camping to five-star luxury hotels, we’ve chosen the best places to stay near Silverstone for the British Grand Prix in July. Our guide to getting the most out of your trackside experience at Silverstone for the British Formula 1 Grand Prix. Great info for us first timers. Thank you, I will update you after our visit to silverstone. Thanks Tom, would be great to hear about your experience at Silverstone.